Just got back today from a week long cruise on the Mariner of the Seas (Royal Caribbean Cruise Lines - RCCL). Had a fabulous time. We cruised from Long Beach CA to Cabo San Lucas, Mazatlan, and Puerto Vallarta then back to Long Beach. Give me a day or two to get back on track and I will be posting again soon. Many times my customers will ask my opinion of products. I am always willing to do that "IF" I have used the product. 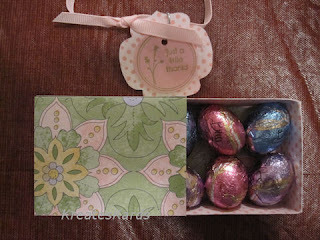 I am a brand new user of the watercolor pencils and crayons that Stampin' Up! sells and thought this would be a good group of products to review. Pencils (Pg 152)... love them, easy to use. Stored in a lightweight metal tin. 24 commonly used colors. Works with both the blender pens & the aqua painter as well as alone. Very portable, easy to travel with. Disadvantage to them: they do not exactly match the SU colors. This was minor, but I was surprised that we didn't have exact matches. 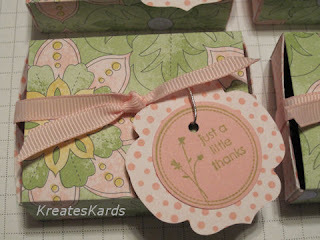 Watercolor Wonder Crayons (Pg 152) ... these are a perfect match for Stampin' Up! exclusive colors. 4 sets of 12 color in storage tins (Bold Brights, Earth Elements, Rich Regals, Soft Subtles). 1 set of six colors (Neutrals). Works well with both the blender pens & aqua painter as well as by itself. Nice size, thick crayons. Comes in lightweight tin for storage. Disadvantage: Have to be careful that they are not left in the heat as crayons can melt. Aqua painter (Pg 190) ... comes in pack of 2. Blends the pencils and the crayon colors nicely. You do have to fill it with water and if you squeeze too much it will leak. It needs to be emptied and air dried before storing. Was a bit messier than I would of liked. Blender Pen (Pg 190)... Comes in packs of 3. Each pen is double ended just like our markers. It has some type of liquid already in it so no need to fill. Easily blends the colors of the pencils and the crayons. You wipe the pen on a paper towel till the tip is clean. Really easy to use. I put pencil/crayons on white paper and rubbed the pen into the color and then onto my stamped image. Worked fine. Also tried it rubbing the tip of the blender pen right on the crayon/pencil, this gave much more intense color and easy to do. When I was finished with it, I cleaned it on a paper towel then put its cap back on. Needs to be stored horizontally like our markers to keep the tips moist. Blender pen wins hands down in my book. 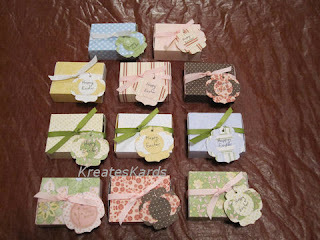 Again, the list above is just a sampling of the stamp sets that will work with the watercolor pencils and crayons. I hope at some point all of you will have the opportunity to try these products. They really expand your ability to be creative and add a designer touch to your creations. 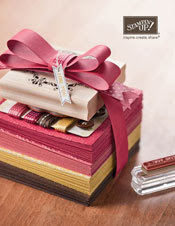 In the Occasions Mini Catalog (April 1 thru June 30, 2009) on Pg 10 there is a new product called Printed Window Sheets. Our printed window sheets offer beautiful designs that you can cut out and use with a 4 1/4" x 5 1/2" card front. 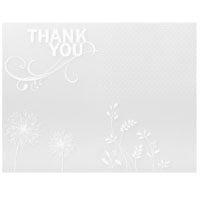 Includes 2 sheets of 4 designs each (total of 8 designs) with images done in whisper white. I apologize for the glare in the photos, I tried numerous ways to take the photo but some glare existed each time because of the material they overlays are made of. The first photo above is a thank you card that I made using cameo coral card stock, ruby red ink (using the Color Spritzer tool - Pg 190 of the big catalog) to speckle the paper, and 1 of the printed window sheets. Attached the window sheet using my Crop-A-Dile and jumbo eyelets. 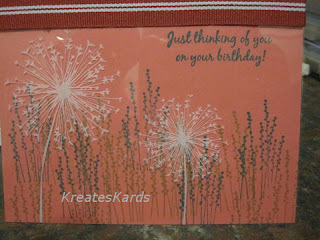 The second photo is a birthday card I made also using the cameo coral card stock. I stamped on some floral images in greens on the card stock then did the overlay that has some beautiful white flower bursts on them. Attached to the card with double sided tape using the ribbon as the cover to the taped area. 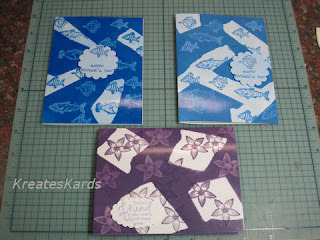 The 3rd image is hard to see, but is of the 4 designs on the 1 sheet of printed window sheets. I will make cards with the other 2 designs so that you can see them more clearly. The 4 designs are: Thank You with Swirl, Flower Bursts, Leaves, and Swiss Dots (my names for them). You just cut the sheet into 4 pieces and they are a perfect fit for your cards using the 8 1/2 x 11 cardstock. This package of two sheets will give you a total of 8 card fronts. Cards for Soldiers - Can you help? NOTE: Even tho a challenge is posted, any and all cards are appreciated and needed. Cards are needed year around. Won't you help. 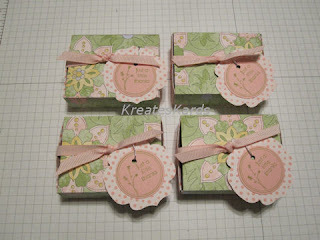 I'm absolutely hooked on the boxes I can make using the Big Shot Matchbox Bigz XL Die (Item # 114890 in our Occasions Mini Catalog). I'm having so much fun making them. Decided to make a few to give to our neighbors as an Easter surprise ... shhhh, don't tell them. 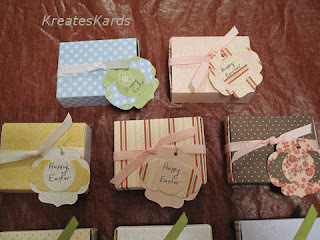 Any color, any pattern two sided design paper works well with these boxes. Wouldn't they make great wedding favors, party favors, or just little gifts for your friends. I have found that the Extended Premimum Crease Pad (Item #117630 $19.95) is an absolute must have with this die. By using the crease pad I'm getting really nice crisp folds. With just the cutting pads, not all the creases/fold lines are showing. With the cutting pads and some shims (card stock under the die to add depth), the crease lines were so deep that when folded they ripped off. When you use the crease pads, you do NOT use the second cutting pad on top of the sandwich. Stampin' Up! has just introduced a great new die for the Big Shot die cutting machine. The die is called: Matchbox BigZ XL Die. It is item # 114890 and is priced at $42.95 in the Occasions Mini Catalog that is valid from April 1 - June 30, 2009. I had a workshop/class at my home today and decided that I wanted to give each of the participants a little "thank you" from me. So last night I got busy and made a Matchbox "box" for each of them and filled it with Dove Chocolates. They were a big hit. I finished them off with a ribbon and a tag. The photos above are of the ones I made last night. Here are 3 examples of the brayer technique in the tutorial. The two blue ones used the exact same colors of ink, but the one on the left was gone over more times to intensify the colors. IMPORTANT NOTE: This is a project that can be a bit messy, but the end result is so worth the effort. I highly recommend that you wear an apron or old shirt when you do this. Also having baby wipes handy is a great idea to get the ink off your fingers if needed. 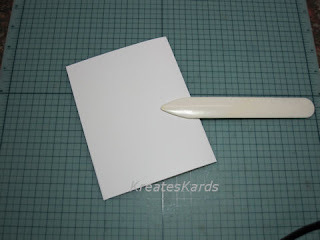 Fold your 8 1/2" x 4 1/4" whister white page in half using the bone folder for a crisp, clean fold. This is the base for your card. Set your folded card piece aside. It will be used at the very end. 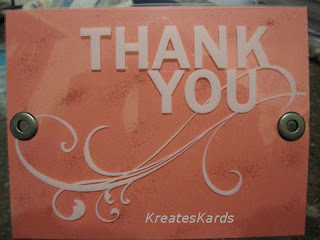 The piece of glossy white cardstock that we will do the brayering on, will be added to the card later. 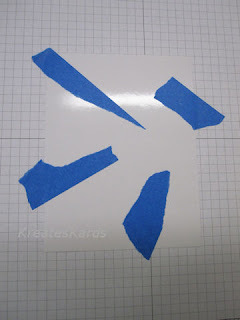 Take painters tape and put random strips of it over the white glossy cardstock. I adhere a little bit off the cardstock too so that it can be easily removed when the brayer color is finished. We are going to use the stamp pad ink and the brayer to gently roll over the glossy white painter that we have put the painters tape on. Do NOT use the brayer until you have completed the next step. 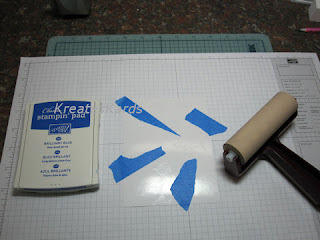 Ink your stamps with versamark ink and then stamp image on the glossy white cardstock. The images will be put randomly over the glossy white cardstock. Let dry for a minute before moving on to next step. Clean your stamps right away. 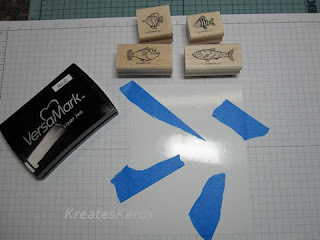 The Versamark Ink is sticky and you want to get it off you stamps as quickly as possible. Using the Stampin' Scrub (Item #102642) and Stampin' Mist Stamp Cleaner (Item #102394) works great for to clean your stamps after using our inks or Versamark. 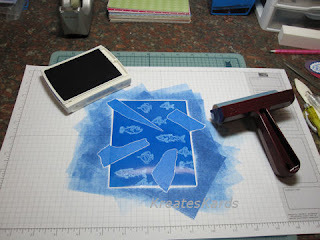 Roll your brayer over the classic ink stamp pad. I go in the same direction with applying the ink to the brayer. Now gently roll the brayer over the card top going in numerous directions and smoothly out the ink as you go. The more you roll over the image, the deeper the color and the image will start to stand out more too. Clean your brayer. You will need to use it again in a couple of minutes. Gently peel off the painters tape. It will leave white areas on the card. 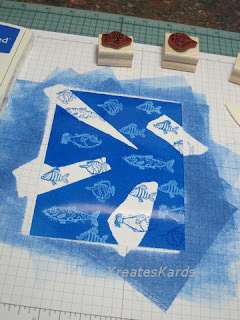 Notice too how well the versamark ink fish show up under the blue ink we put on with the brayer. 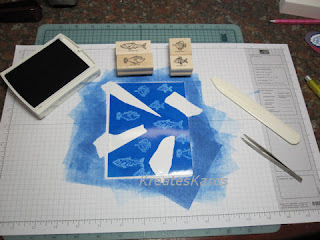 Now using Brilliant Blue Classic Stamp Ink, put additional fish images over the white areas and some on the blue areas too if you would like. 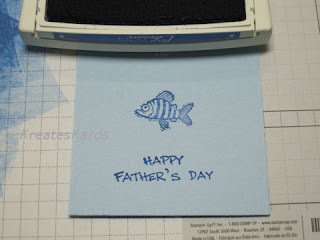 Then using Bashful Blue Classic Stamp Ink, brayer again over the complete card. It will put a light blue over the white areas. 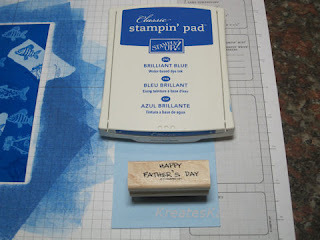 Stamp Happy Father's Day with Brilliant Blue Stamp Pad Ink on the Bashful Blue piece of card stock. Do not stamp too close to the bottom edge. This stamp is from the And Many Mower stamp set. 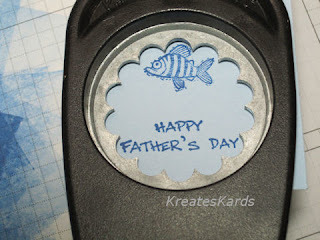 Using Brilliant Blue Stampin Pad Ink, stamp one of the smaller fish from the Just Beachy Stamp Set above the Happy Father's Day. Don't space them too far apart. You want this to fit inside of the Scallop Circle Punch. 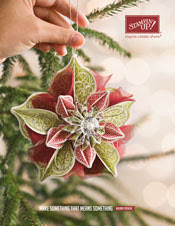 Using the Scallop Circle Punch, punch out your design being sure not to cut any of it off. Put two dimensions on the back of the scallop circle you just punched out. One side of dimensions is sticky, put that onto the back of the scallop circle. 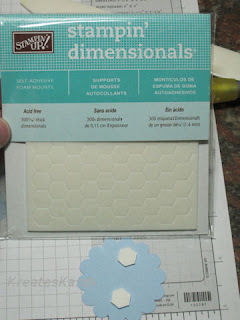 Then remove the paper off the back of the dimensional, exposing the other adhesive side to each. Now place the Scallop Circle on your card front. Then using snail adhesive attach this card front to your folded card base. I find it easiest to work from the folded side, matching the fold then top and bottom. Turn your card over and gently press to adhere the card front to the card base. Because the card front has so much design on it, I try not to rub my fingers over it so press from the back. 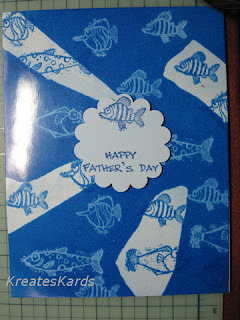 Don't forget to decorate your envelope with some of the fish too for an added design. I had hoped to post another tutorial this week. It's been very hectic here, so just haven't had the time. But I am working on a few projects behind the scenes that I will post soon. 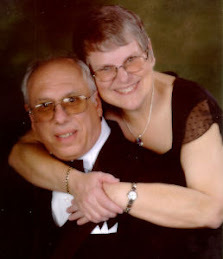 Thank you so much for taking the time to view my blog and to follow my progress.